Hapeville Radiator: Motors, Transmissions, Emissions, Brakes, Oil Changes, Maintenance, Radiators & more..
All cars, trucks, vans, and suvs need regular scheduled maintenance on a regular basis. From basic oil changes to overhauling engines and transmissions, all of our automotive repair services are performed to the highest degree of workmanship quality with superior auto parts. Inspections and diagnostics comes with detailed explanations of whatever problem that your vehicle may have. We offer a high degree of expertise in electrical and emissions diagnostics, heat and air conditioning, overhauling engines and transmissions and all car repairs. We would count it a privilege for you to use our auto repair shop so that we can build a long time relationship as we have with many others. If you visit us, you will quickly see the real auto care difference. WE ARE EXPERTS AT EMISSIONS and ELECTRICAL PROBLEMS. If you have ever had an electrical or emissions problem, you likely know that they are often not easy to diagnose. We specilize in electrctrical and emissions diagnostics so we expertly diagnose the problem quickly and repair it right, saving you time and money. 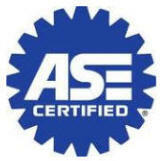 At Hapeville Radiator, we are ASE Certified with training in all automotive diagnostics including check engine lights, emissions, electrical modules including automotive computers. Regardless of your year, make, model, or problem, we have the experience and diagnostic equipment to get your car, truck, van, or suv repaired. Is it time to have your brakes inspected? Are you experiencing a brake problem? We will actually show you the brake components that are in need of repair or replacement. We are experts at service and repair for all brakes from brake pads and brake shoes to ABS systems. Regular Scheduled Maintenance is the number one need to keep your car, truck, van, or suv operating at peak performance for the longest time. When we change your oil, we check several things and look your car over to let you know its overall condition. At Hapeville Radiator, we specialize in Automotive Air Conditioning. We repair and install heat and A/C in all types of vehicles. If your heat and air is not working right, we can repair it so you can be comfortable soon. Properly diagnosing fan clutches, water pumps, transmission coolers, thermostats, electric fans, hoses, heater valves, cooling system flush, heater cores, freeze plugs, head gaskets, and radiators of any year, make, and model takes the expertise of Hapeville Radiator. Not only are we experts at diagnostics, we repair at affordable rates that you can trust. Getting your timing belt or chain replaced can be one of the most trying and expensive automotive repairs. Not so at Hapeville Radiator. We know what to do and we do it with your best concerns in mind. We have changed many timing belts and chains and we can replace yours in the least amount of down time and as affordably as possible. From poor engine performance to CHECK ENGINE lights, our services includes transmission and engine installations, rebuilds, and exchanges. We use the latest electronic testing equipment, tools, and certified techniques. For the best in engine and transmission performance, we are experienced and affordable. Hapeville Radiator offers superior repair and service to Hapeville, South Atlanta, East Point, College Park, Forest Park, and surrounding communities. We are known for quality maintenance and and repair. We use our knowledge of automotive technology to help our customers maintain reliable performance from their cars, trucks, vans, and suv's for as many years as possible. We use modern diagnostic equipment to diagnose electronic problems and perform mechanical repairs and service factory scheduled preventative maintenance. We are your alternative to new car dealer service. We have the up to date equipment and mechanical skill to work on the latest models and makes of cars and trucks. We use the latest auto diagnostic equipment for all of your electrical diagnostics and emissions diagnostics on all import cars and domestic cars and trucks. Truck engines, car engines, car transmissions, and truck transmissions are our specialty.